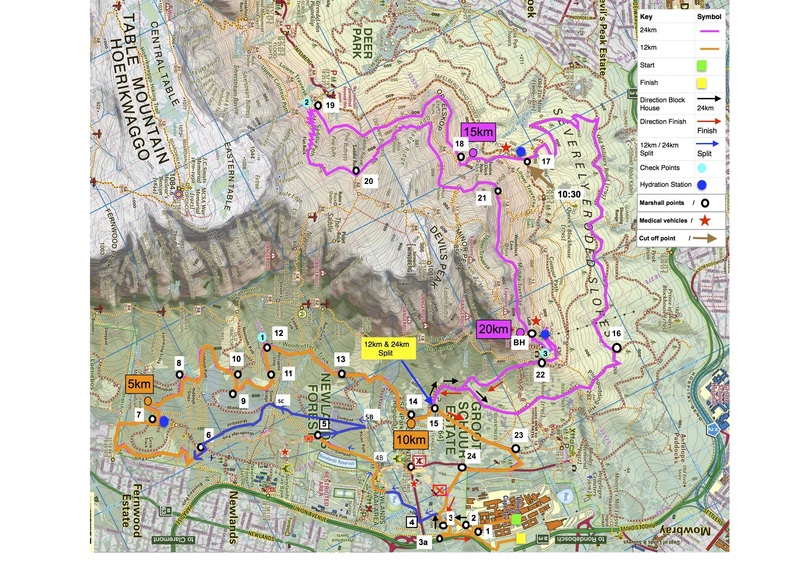 Both routes start from the University of Cape Town (UCT) grounds and will take runners along the lower slopes of Devil’s Peak and adjacent forests. Beginner trail runners should enter the short distance, as trail running times are often double that of road running. This is due to the variable terrain and the steep ascents and descents. Trail runners should wear trail shoes for better grip and carry their own hydration – a bladder pack or hip belt. Starting from UCT, the routes kick off with a gentle uphill warm up, past Mount Pleasant and into Newlands Forest. Following the Newlands forest jeep tracks on to the Orchards Trail, the route passes the Woodcutters ruins and enjoys kilometers of beautiful forest and streams as it meanders up to Woodcutter track. A pleasant descent sends runners through Avatar Forest and The Old Zoo before finishing at UCT. Starting from UCT, the routes kick off with a gentle uphill warm up, past Mount Pleasant and into Newlands Forest. Following the Newlands forest jeep tracks on to the Orchards Trail, the route passes the Woodcutters ruins and enjoys kilometers of beautiful forest and streams as it meanders up to Woodcutter track. Heading towards the King’s Block House, runners enjoy spectacular views of the City, Robben Island and the Coast line. Saddle Path presents a steep ascent leading up to Middle Traverse before a gnarly scramble down the ridge line. A pleasant descent sends runners through The Old Zoo before finishing at UCT.